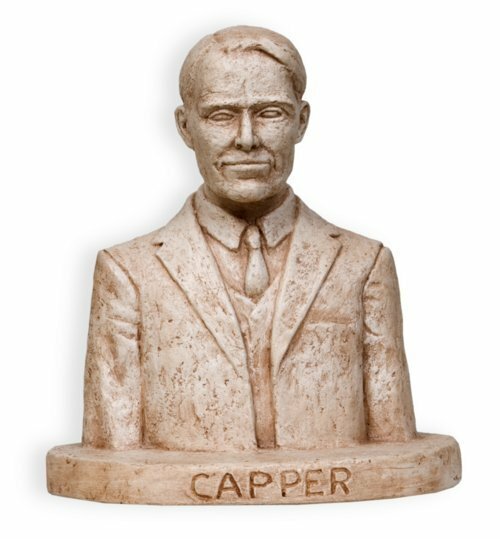 Small plaster bust of Senator Arthur Capper by Kansas artist Peter "Fritz" Felten, Jr. The model is associated with the 1981 installation of statues in the Kansas statehouse rotunda. A special committee selected Felten from Hays, Kansas, as the sculptor of statues depicting four notable Kansans--Capper, Amelia Earhart, Dwight Eisenhower, and William Allen White. Felten created this small model and three others to demonstrate his design concept. Originally from Garnett, Kansas, Arthur Capper established a large publishing enterprise in Topeka. In 1915 he was elected Kansas Governor and later served 30 years in the United States Senate. According to Felten, Capper was fairly easy to sculpt because "he was such a humble looking man who always stood with hunched shoulders."